Thankfully we started 2018 as we finished 2017 with another winner, as Three Ways deservedly put his head in front over fences at Catterick on New Years Day. 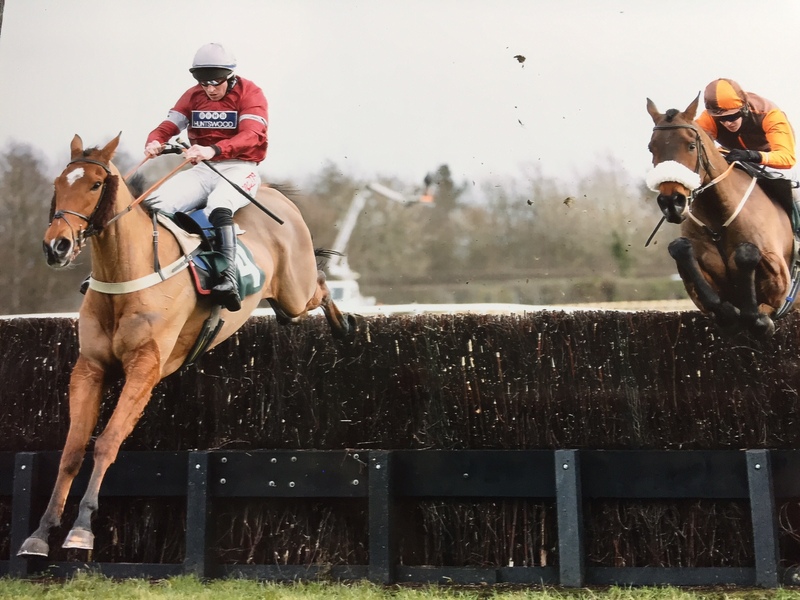 Having been runner up in two novice chases already this season, he put his experience to good use as he jumped to the front at the last and readily went 5 lengths clear only to idle inside the final 50 yards. He beat a decent yardstick who started favourite for the Pertemps Final at the Cheltenham Festival last season. We’ll look to get some more experience into him, but the 4-mile novice chase at the Festival might be a suitable target for him this season, and I can see him developing into a Midlands/ Welsh National horse for next season. Three Ways wins over fences at Catterick for David Brownlow (Huntswood). We were close to having a double on the card as Kalahari Queen was only just denied in the mares novice hurdle. She was done for a bit of speed by the winner and was conceding a penalty for her earlier Lingfield win too. 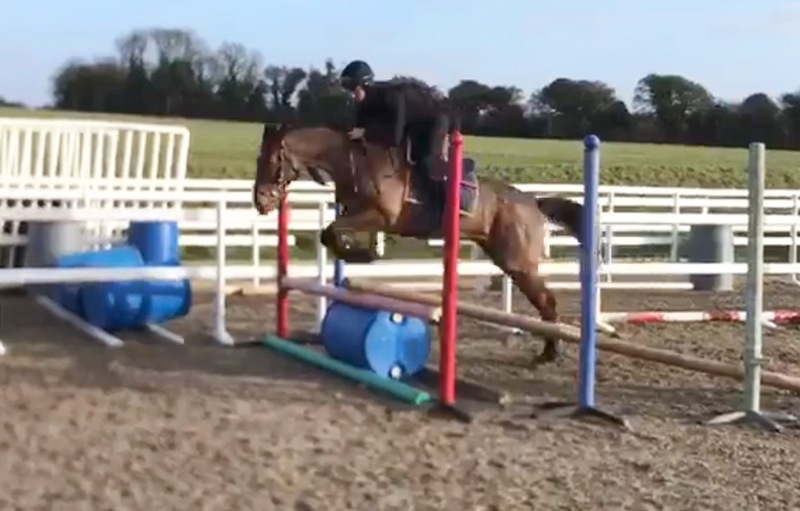 I think there should be a lot more to come from her, especially when she goes up in trip and over fences. The northern raiding party - Three Ways and Kalahari Queen. Dans Le Vent finished 5th in the Grade 1 Challow Hurdle at Newbury on the Saturday before the New Year. He far from disgraced himself however he found the ground too deep and didn’t get home on the heavy going. He will have learnt a lot from that though, and he’ll continue to progress throughout the season. We will let the dust settle, give him a moment to recover and then look to run once more between now and the Festival in March, and I hope that next race will tell us where to aim for come Cheltenham. It was a shame that Wetherby was called off today, as I was very much looking forward to running Naranja over 3m in a mares handicap hurdle. It looked a suitable opportunity for her, and I hope the BHA put on some more of these types of races as there is a shortage of them…..
We’ve been doing a fair amount of schooling yesterday, and two youngsters who look quite exciting are Carntop and Some Day Soon, both of whom have taken well to jumping in the outdoor school. Carntop was 2nd in the Lingfield Derby Trial and looks a smart recruit off the flat, whilst Some Day Soon was placed in a couple of Irish Bumpers and should be able to win his bumper over here before progressing onto better things over hurdles. Carntop looks good on his debut over poles. 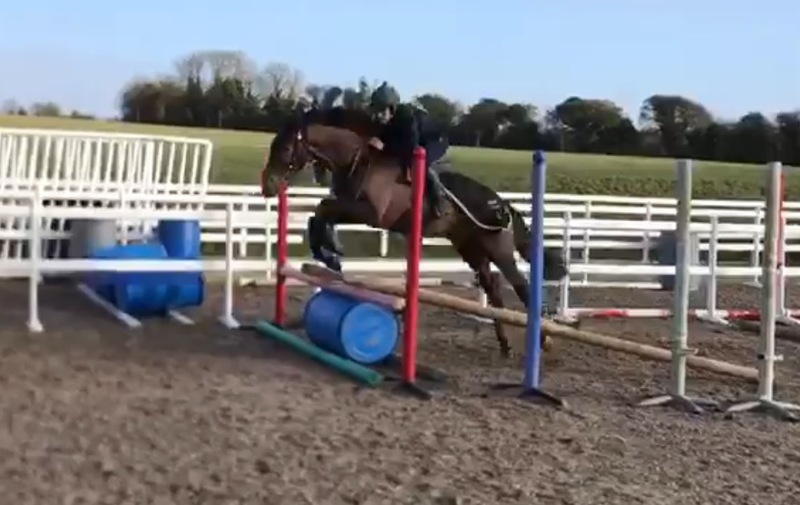 Some Day Soon looks a natural over poles. 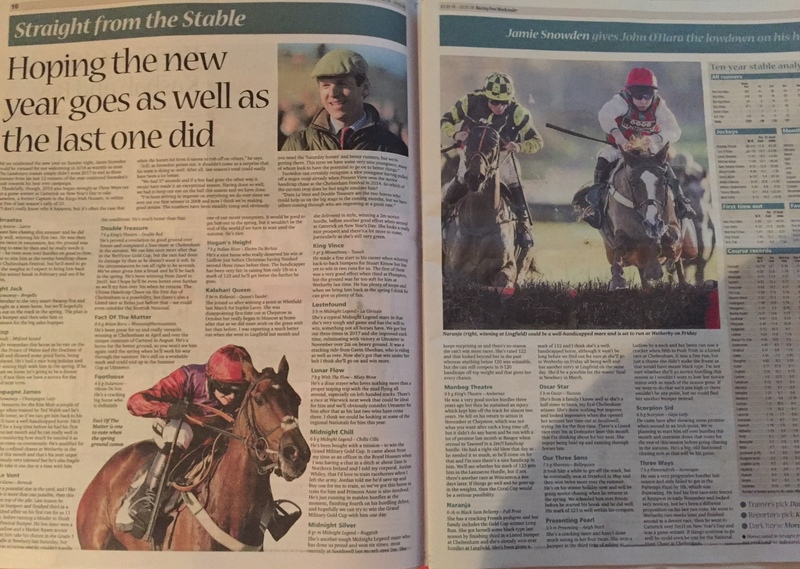 I was thrilled that the Racing Post Weekender gave us a good plug in this weeks newspaper.